With ‘there is an end of an auld Sang’, Scott alludes to the response of James, 1st Earl of Scafield and Chancellor of Scotland to the 1707 Treaty of Union of the Scottish and English Parliaments.2 Article 19 of the Treaty of Union, however, preserved the jurisdictions of the Scottish Court of Session and Court of Justiciary, and further declared that ‘no Causes in Scotland be cognizable by the Courts of Chancery, Queen’s-Bench, Common-Pleas or any other Court in Westminster-Hall; and that the said Courts, or any other of the like Nature, after the Union, shall have no Power to cognize, review, or alter the Acts or Sentences of the Judicatures within Scotland, to stop the Execution of the same.’ After 1707, the final court of appeal for civil cases decided in the Scottish Court of Session was the House of Lords. In 1706, Scottish patriot Andrew Fletcher of Saltoun had voiced his concern that after the union ‘judicatories for administering justice and the cognizance of all law suits shall be carried up to London, either by first instance or by way of appeal.’3 Fletcher’s contemporary George Mackenzie, the Earl of Cromarty, despite his support for a form of union that would incorporate the English and Scottish parliaments, also warned that since ‘the Treaty of Union would leave Scotland nothing of sovereignty […] to reside amongst us but our sovereign courts of judicature’, legal appeals from Scottish to English courts should be prohibited.4 Echoing Fletcher’s and Mackenzie’s concerns more than a century later, Scott’s distress at this phenomenon of frequent appeal to London presents an enduring picture of Scots law as the main repository of Scottish sovereignty as well as cultural and national honor, and its independence as a cause worth dying for. Scott’s references to the ‘bench’ and ‘Bar’ also point to his own professional connections to Scots law as an advocate. In 1826, Scott was serving as a Clerk of Session in the First Division of the Inner House, the appellate chamber of the Court of Session, the supreme civil court which sat at in Parliament House in Edinburgh. His involvement in the Scottish criminal law consisted in his service as Sheriff of Selkirkshire, an office which entailed presiding over parliamentary elections, supervising criminal investigations within the district, attending the Circuit Court at Jedburgh, and, when the Court of Session was in recess, presiding as magistrate in the Sheriff Court at Selkirk.5 Between 1808 and 1825, multiple reforms in the Scottish legal administration had taken place, most importantly the establishment of a jury trial in civil cases in 1815 and the dissolution of the separate Scottish Court of Admiralty in 1825, with the general effect of bringing Scots law into closer accord with English law.6 Scott had disagreed with the details and direction of these cascading reforms,7 which seem to have contributed to the feeling of compounded professional and personal losses and impending ‘catastrophe’ apparent in his journal entry. But Robin Oig gets the final word in the tale, and troubles its resolution of contradictory English and Scottish customary laws and national prejudices via the courts. He faces execution ‘with great firmness’ while defending the ‘wild justice’ of his act and its repercussions: ‘[h]e repelled indignantly the observations of those who accused him of attacking an unarmed man. 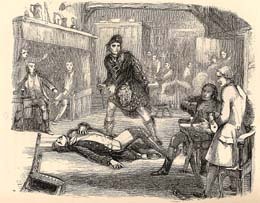 “I give a life for the life I took,” he said, “and what can I do more?”‘14 While Scott anticipates and even mourns in advance the ‘catastrophe’ of the loss of Scottish legal sovereignty in the pages of his journal, the ‘catastrophe of our tale had taken place’ in ‘The Two Drovers’ in Robin’s deed of vengeance against the arrogant Englishman, for which he pays an equal penalty.15 One of the witnesses to the blow with which Harry levels Robin Oig at the inn, the dishonest bailiff who had negotiated the invalid contract for the same pasture that had caused the quarrel between the two friends, explains to some puzzled bystanders to the fight that ‘”It is only a d—d Scotsman, […] whom Harry Wakefield helped to his broth to-day, who is now come to have his cauld kail het again.”‘16 An expression of ‘the ancient grudge against the Scots […] to be found lurking in the Border countries’, this utterance of a Gaelic phrase by an untrustworthy English character not only undermines from within the speaker’s contempt for the Scotsman but also casts doubt on the Judge’s serious attempt to correct or quarantine Scottish and English ‘prejudices’.17 Like the Highlander’s ‘wild justice’, the Scottish law and customs, far from being a cold broth reheated, or an outmoded system destined to be incorporated into the English common law, seem to possess a stubborn resilience, tied to the persistent urgency of upholding Scottish national identity and honor.18 While Robin Oig’s insistence on his revenge may be irrational and illegal, his strain of independence still inhabits Scott’s own passionate defense of Scots law. 1 Entry for Thursday, 8 June 1826, in The Journal of Sir Walter Scott, ed. W. E. K. Anderson (1972; Edinburgh: Canongate Books, 1998), pp.179-80. 2 The Journal of Sir Walter Scott, ed. W. E. K. Anderson, p.179n4. 3 Andrew Fletcher, State of the Controversy Betwixt United and Separate Parliaments (1706), 20; quoted in Brian P. Levack, The Formation of the British State: England, Scotland, and the Union 1603-1707 (Oxford: Clarendon Press, 1987), p.87. 4 George Mackenzie, A Letter to a Member of Parliament upon the 19th Article of the Treaty of Union Between the Two Kingdoms of Scotland and England (1706), pp.7-8; quoted in Levack, The Formation of the British State, p.87. 5 W. E. K. Anderson, ‘Introduction’, The Journal of Sir Walter Scott, pp.xxv-xxvii. 8 Walter Scott, Chronicles of the Canongate, ed. Claire Lamont (Edinburgh: Edinburgh University Press, 1995), p.123. 13 Walter Scott, Chronicles of the Canongate, ed. Claire Lamont (Edinburgh: Edinburgh University Press, 1995), p.145. 18 I found an explanation of the phrase ‘his cauld kail het again’ in ‘Dance Trivia’, by John Shaw, published in The Scottish Country Dancer, Vol. 4, No. 1 (July/August 2007). The article explains that ‘cauld kail’ is also the title of a 32 bar strathspey/reel medley.